web browser plug-in. It enables a wide range of applications and content on the Internet, from games, to video, to enterprise apps. The traditional browser plug-in model has enabled tremendous innovation on the web, but it also presents challenges for both plug-ins and browsers. The browser plug-in interface is loosely specified, limited in capability and varies across browsers and operating systems. This can lead to incompatibilities, reduction in performance and some security headaches. That’s why we are working with Adobe, Mozilla and the broader community to help define the next generation browser plug-in API. This new API aims to address the shortcomings of the current browser plug-in model. There is much to do and we’re eager to get started. As a first step, we’ve begun collaborating with Adobe to improve the Flash Player experience in Google Chrome. Today, we’re making available an initial integration of Flash Player with Chrome in the developer channel. We plan to bring this functionality to all Chrome users as quickly as we can. When users download Chrome, they will also receive the latest version of Adobe Flash Player. There will be no need to install Flash Player separately. Users will automatically receive updates related to Flash Player using Google Chrome’s auto-update mechanism. This eliminates the need to manually download separate updates and reduces the security risk of using outdated versions. With Adobe's help, we plan to further protect users by extending Chrome's “sandbox” to web pages with Flash content. These improvements will encourage innovation in both the HTML and plug-in landscapes, improving the web experience for users and developers alike. To read more about this effort, you can read this post on the Flash Player blog. Developers can download the Chrome developer channel version with Flash built in here. To enable the built-in version of Flash, run Chrome with the --enable-internal-flash command line flag. Adobe Flash Player is the most widely used web browser plug-in. It enables a wide range of applications and content on the Internet, from games, to video, to enterprise apps. What's New in Google Chrome? Geolocation API: Run with the --enable-geolocation flag. Unpacked extensions are now remembered across browser restarts. Favicons for extension pages (define with a 16x16 image in your manifest.json). setPopup() was added to browserAction and pageAction for dynamically changing which popup to show based on the selected tab. Remember to follow us on Twitter: @ChromiumDev! Because ANGLE aims to implement most of the OpenGL ES 2.0 API, the project may also be useful for developers who are working on applications for mobile and embedded devices. ANGLE should make it simpler to prototype these applications on Windows, and also gives developers new options for deploying production versions of their code to the desktop. We hope that other WebGL implementors and others in the graphics community will join us to make ANGLE successful! For more info on ANGLE and to access the code repository, visit the new project on Google Code or join our discussion group. We're happy to announce a new open source project called Almost Native Graphics Layer Engine, or ANGLE for short. The goal of ANGLE is to layer WebGL's subset of the OpenGL ES 2.0 API over DirectX 9.0c API calls. We're open-sourcing ANGLE under the BSD license as an early work-in-progress, but when complete, it will enable browsers like Google Chrome to run WebGL content on Windows computers without having to rely on OpenGL drivers. Current browser implementations of WebGL need to be able to issue graphics commands to desktop OpenGL to render content. This requirement isn't a problem on computers running OS X or Linux, where OpenGL is the primary 3D API and therefore enjoys solid support. On Windows, however, most graphics-intensive apps use Microsoft Direct3D APIs instead of OpenGL, so OpenGL drivers are not always available. Unfortunately, this situation means that even if they have powerful graphics hardware, many Windows machines can't render WebGL content because they don't have the necessary OpenGL drivers installed. ANGLE will allow Windows users to run WebGL content without having to find and install new drivers for their system. indicate that Native Client executables perform at 97% of the speed of an unmodified executable on both ARM and x86-64 processors. These results indicate that a browser running on virtually any modern computer or cell phone could run a fast, performance-sensitive Native Client application. However, we recognize that just running on today’s most popular architectures isn’t enough; if a new processor architecture emerges, it should be able to run all Native Client modules already released without requiring developers to recompile their code. That’s why we’re also developing technology that will enable developers to distribute a portable representation of Native Client programs using LLVM bitcode. Using this technology, a browser running on any type of processor could translate the portable representation into a native binary without access to the source code of the program. If you’d like to review our instruction-set support or give us feedback about the technology, please visit our project on Google Code and join our Google Group. One of the most important principles of the web is portability: a web page renders and behaves the same way, regardless of the browser’s operating system or the type of hardware it’s running on. When we first released Native Client a year ago, we supported all popular operating systems (Windows, Mac OS X, and Linux) but only on machines with x86 processors. Today, we’re happy to say that you can build and run Native Client binaries for all of the most popular processor architectures: x86-32, x86-64, and ARM. Even better, our initial benchmarks indicate that Native Client executables perform at 97% of the speed of an unmodified executable on both ARM and x86-64 processors. These results indicate that a browser running on virtually any modern computer or cell phone could run a fast, performance-sensitive Native Client application. You can also use Sputnik to compare browser conformance. For example, below is an experimental plot that compares five popular browsers and which we hope to update as new stable versions of the browsers are released. 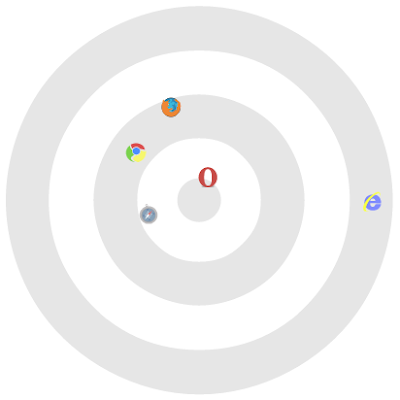 We created this chart by running Sputnik in each of the five browsers and then plotting each browser such that the fewer tests a browser fails the closer it is to the center and the more failing tests two browsers have in common the closer they are placed to each other. In this example, when running Sputnik on a Windows machine, we saw the following results: Opera 10.50: 78 failures, Safari 4: 159 failures, Chrome 4: 218 failures, Firefox 3.6: 259 failures and Internet Explorer 8: 463 failures. We are excited to see the efforts on conformance testing by other browser makers. For example, where Sputnik tests the language features in ECMAScript 5 which were also present in ECMAScript 3, Microsoft's es5conform project tests the new language features that were added in ECMAScript 5. Incompatibilities between browsers remain one of the biggest challenges for web developers. We hope that giving users and browser vendors an easy way to test their browser will help promote browser robustness and compatibility across the industry. The Google Chrome Beta channel for Mac and Linux has been updated to 5.0.307.7 and the extensions gallery now offers more than 3000 extensions for users to choose from. For Google Chrome extensions, we've just released a couple of new experimental APIs, including a history API. Since these are experimental APIs, the extensions gallery won't allow you to upload extensions that use them. However, we'd like to encourage you to read the documentation, give it a try, and send us your feedback. Merge all of the open tabs into a single window. Use OAuth to connect to web services. Make cross-domain XMLHttpRequests from a content script. Display page actions based on the current URL or the current page's content. We also plan to hold events in Germany and will be announcing more information about those soon, so stay tuned! This is just the first post of the many Google Chrome developer updates, let us know what you would like to see in future updates and follow us on Twitter at @ChromiumDev. This is the first issue of Google Chrome Update for Web Developers. In these regular updates, we'll inform you about new features enabled in Google Chrome and announce updates of Google Chrome related developer events. We will also be sharing samples and highlighting cool extensions and HTML5 apps written by the developer community.
. The idea is that we can add new APIs to the platform that may not be ready for prime time. This allows you to play with these APIs and give us feedback before they’re final, which in turn helps us get them out to everybody more quickly. Our first two experimental APIs — chrome.experimental.history and chrome.experimental.processes — are available on the dev channel. The history API lets you query and modify the user’s browsing history. When it’s finalized, we’ll also allow you to replace the history page with your own, just like you can replace the new tab page today. The processes API allows access to information about Google Chrome’s process model, including process IDs and the CPU usage of individual tabs. The processes API is incomplete, but you can see upcoming features in its design doc. These APIs have a few major limitations. First, to use an experimental API you must add a command-line flag when you start Google Chrome (--enable-experimental-extension-apis). Second, you can’t upload extensions that use experimental APIs to the Google Chrome Extensions Gallery. Finally, these APIs will change in incompatible ways, so the code that you write today isn’t guaranteed to work tomorrow. What this really means is that these APIs are only useful for you to play with. You won’t be able to share extensions that use these APIs with a lot of people. However, we’d really like you to try them out and give us feedback. Doing so will help us release the APIs more quickly and make sure they do everything you need. Playing with the experimental APIs is also a way for you to get experience with them before most other developers. We expect to add more experimental APIs over time, so keep an eye out for future announcements. You might have already noticed this, but we now have some APIs that we’re referring to as experimental. The idea is that we can add new APIs to the platform that may not be ready for prime time. This allows you to play with these APIs and give us feedback before they’re final, which in turn helps us get them out to everybody more quickly.